The seven mile gravel track to Palm Canyon that branches east from US 95 across the edge of the wide, empty La Posa Plain is flat but rather bumpy, and the drive can take over half an hour. The canyon is the most visited location within Kofa National Wildlife Refuge, partly since it is the last place in the state where native California palm trees grow in their natural habitat. 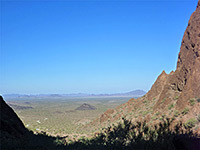 The last mile of the approach road climbs gradually and ends at a parking area, high enough to enjoy views over a huge area of the surrounding Sonoran Desert. Around one hundred trees are found in a narrow, southeast-facing, side ravine further up the canyon; they are quite well-hidden and only visible when close by. A half mile path - steep and uneven in places but not at all difficult - leads along the canyon to a viewpoint below the trees. To get closer, it is necessary to scramble down into the canyon and up the hillside opposite. Looking at trees is the only obvious activity hereabouts, though it is quite easy to continue climbing up the main canyon and explore more of the rocky surroundings, at the edge of the Kofa Mountains. Map of Kofa National Wildlife Refuge. 20 views of Palm Canyon, and the wildlife refuge. The unpaved track to Palm Canyon leaves US 95 nineteen miles south of Quartzsite. The first 3 miles are bumpy, graded and relatively wide, up to the NWR boundary, beside which are various notices and information displays. The remaining 4 miles are narrower but smoother, climbing gently towards the end. The elevation here is 2,120 feet, only about 600 feet above the great desert plains to the west, but high enough for far-reaching views towards the distant Chocolate Mountains, and other ranges. Free primitive camping is permitted anywhere in the wildlife refuge, and the trailhead has a designated area on the north side, on top of a little hill. The path to the palms descends slightly, crosses the wide, stony streambed at the mouth of the canyon, then rises to a boulder-covered ridge on the far side. The remainder of the short hike is eastwards, close to the south edge of the canyon, staying about 40 feet above the wash. All of the route is in shade in early to mid morning owing to the steep slopes that enclose the drainage to the north, east and south. The path ends at an elevated viewpoint of the palms, marked by a sign. The trees are not so obvious since they grow in a steep, narrow, vertical-walled side ravine which is in shadow nearly all of the day. They are about 700 feet distant from the viewpoint, and 400 feet higher. 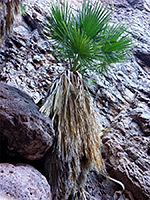 There is no official route to the palms but they can be reached by off-trail hiking; walking down to the streambed and climbing a little gully just east of the main side ravine. 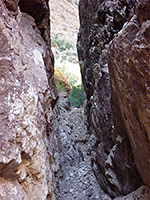 This narrows towards the top, beyond which is a small flat area and a short descent, down to the wider canyon, just beneath the lowest tree. 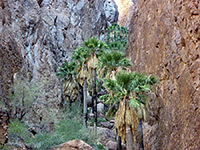 Beyond, the palms are spread out along 350 feet of the ravine, growing beside and between big boulders, which can be climbed, but they gradually become larger, and the canyon more overgrown. At least half of the palms can be seen relatively easily, however. Back in the main canyon, a faint track leads further upstream, past boulders, patches of slickrock, short enclosed channels and open, bushy areas. A similarly steep tributary ravine on the south side is home to at least one palm tree. After about half a mile, the cliffs recede, especially to the north, forming a wide bench (at around 3,100 feet elevation), the slopes now covered with a fine selection of desert plants including saguaro, red-spined ferocactus, agave, cholla and palo verde. From here more of the mountains can be seen by level walking away from the canyon, in particular to the northwest. The bench is still a long way below the summit (4,877 foot Signal Peak), and another array of dark, vertical cliffs rises up to the east, offering no easy routes higher up. Wildflowers are quite plentiful in the upper reaches of Palm Canyon, mostly in moist places along the streambed.